Ecosa Mattress Review - Do You Need an Adjustable Mattress? I’m jazzed about this review, because I’ll be diving into the Ecosa mattress, a waterproof bed that also happens to be fully adjustable! This means its three layers of memory foam and poly foam can be moved around to your heart’s content, creating three completely distinct feels. But does the bed’s shape-shifting nature sacrifice comfort for flexibility? I won’t know until I put it to the test, scoping out its firmness and feel in various arrangements to determine if the Ecosa might be the perfect mattress for you. Continue reading below for my full Ecosa bed review. Don’t have time to read it all? Click here to skip to the bottom and read the summary. The Ecosa mattress is an adjustable all-foam mattress, made of three interchangeable layers that arrive in the bed’s medium configuration, with the option to flip and finagle as the sleeper sees fit. Save $125 on your purchase of an Ecosa mattress with the code SLEEPOPOLIS! Ecosa was founded in 2015 in Melbourne, Australia. By 2017 the company had expanded into a global brand, thanks to its adjustable firmness and budget-friendly price. The company’s charitable ethos makes them popular with socially conscious consumers as every mattress and pillow return is donated to partner charities. While the company is known primarily for mattresses, Ecosa also sells memory foam pillows, mattress toppers, bamboo sheets and silk pillowcases. The Ecosa mattress is an adjustable all-foam mattress, made of three interchangeable layers that arrive in the bed’s medium configuration, with the option to flip and finagle as the sleeper sees fit. This bed measures 10” from top to bottom, no matter how you stack it. I should also note that no matter the construction, the bed features a thin, machine-washable outer cover that zips off for easy access, and an inner cover that makes the mattress both waterproof and (supposedly) impervious to dust mites. To see how all this comes together, let’s take a look at this bed’s unique construction in each configuration! 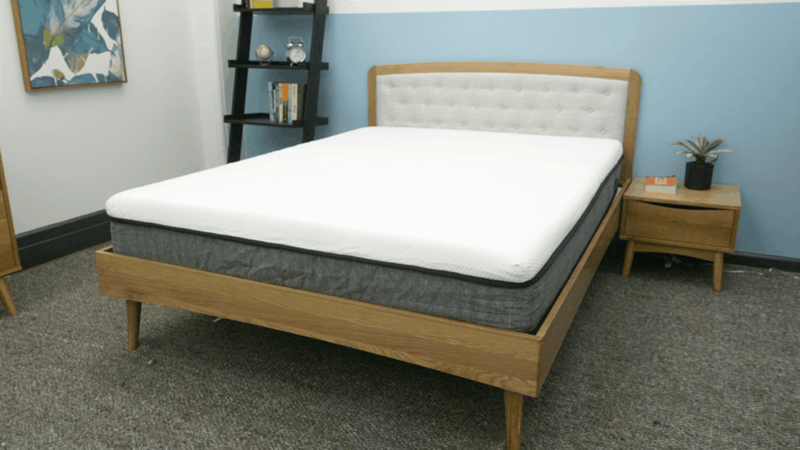 Medium Configuration – The softest possible arrangement of this bed, the medium configuration places two inches of soft, sinkable G-7 gel memory foam on top; a layer of ECO-tex memory foam in the middle, and HD poly foam on the bottom. Memory foam in the top layer provides excellent contouring, lending pressure relief and softness to the initial feel. Gel particles, meanwhile, help keep the sleeper cool and mitigate memory foam’s notorious tendency to overheat. Medium-Firm Configuration – A little firmer than the medium, this configuration swaps the top layer of memory foam with the middle layer of ECO-tex foam. 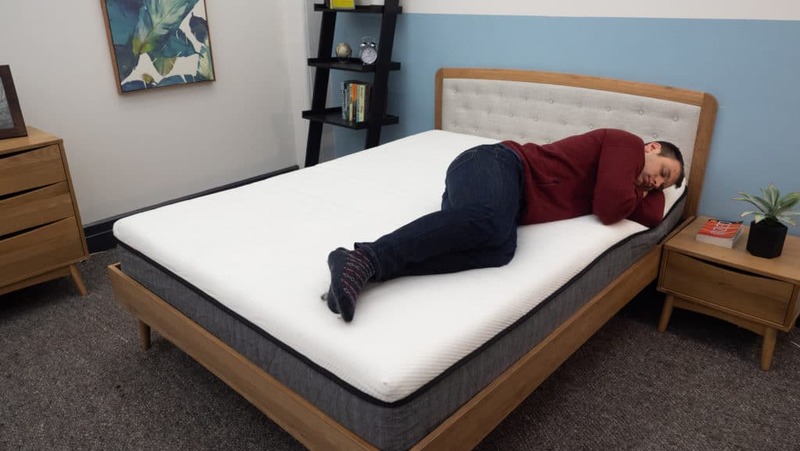 The ECO-tex foam layer supplies a bit more bounce and support, which will change up the feel of the top layer and allow for a feeling of sleeping “on” the bed instead of “in” it. The base layer remains the same. Firm Configuration – The firmest version of this bed inverts the medium arrangement, placing a thick layer of dense, supportive HD poly foam on top. Using the firmest layer as the top layer provides a feeling of immediate support and structure, as well as quick pressure response and deep compression relief. In this configuration, the softer memory and poly foams are placed on bottom. Now that we’ve taken a closer look at the Ecosa’s unique construction, let’s dive in and explore this bed’s unique firmness and feel. This bed has many sides to explore, so I’ll be examining each custom configuration and giving you a general sense of what to expect with each one. Since everybody is going to feel firmness a little differently, I wanted to get a few more opinions on the bed. Instead of giving just my own opinion on firmness, I asked three other Sleepopolis experts to give their opinions as well. This should give you a fuller sense of the firmness range you can expect. With the layers stacked in the medium arrangement, this bed struck me as quite gentle, about a 6/10 on the firmness scale. The placement of the soft memory foam layer up top allowed for some satisfying sinkage and pressure relief as the material contoured to my shoulders and hips. That being said, side sleepers will probably benefit most from this configuration, as it provides the most pressure relief to sensitive spots along the spine. In the medium firm arrangement, I personally found the bed to feel very similar to the soft orientation: almost as gentle, but with a tad more support and bounce. I would say there’s maybe a half point of added firmness in this configuration, making it a 6.5/10 as compared to the above 6/10. This medium firm feel should satisfy combo sleepers as it’ll likely place them more “on top” of the bed than “in it” for easy mobility. And finally, the firm arrangement is considerably firmer in my opinion, coming in at 7.5/10, the highest score of the three configurations. Flipping the dense polyfoam base layer to the top imbues the structure with an immediately supportive vibe that’s not undone by the gentler comfort layers below it. This is the best arrangement for stomach sleepers, as it provides plenty of hip support and prevents the lower body from sinking too far into the bed. Another great way to get an idea of the way a mattress really feels is to look at where pressure points form when the sleeper lies down on the bed. Since pressure relief is such a crucial component of any mattress purchase, I wanted to give the fullest picture possible in this category. To do this I placed a pressure map on top of the mattress and lied on my back, side, and stomach. I did this for each configuration of the mattress. On the image below pressure will be represented from blue (low pressure) to red (high pressure). 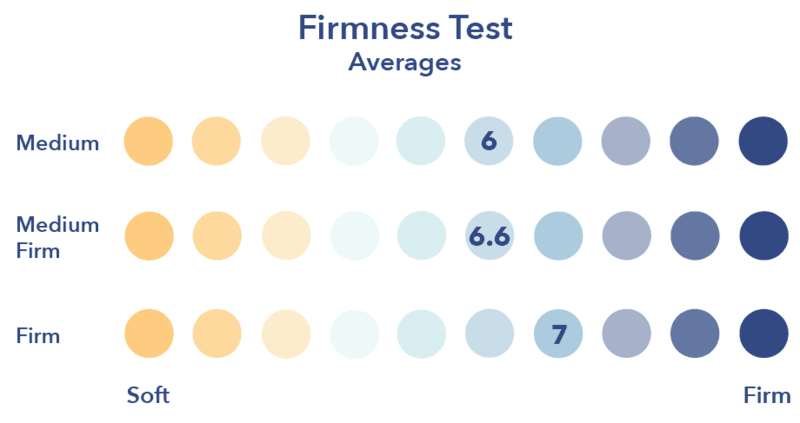 Back – While lying on my back, my weight was evenly distributed regardless of which firmness level I chose, as you can see from the nearly all blue pressure map results above. In this position, I could feel the foam layers filling in the space at my lower back and hips. I sunk lightly into the top layer of foam in both the soft and medium firm arrangements, experiencing a fair amount of body-contouring with the memory foam. In spite of this sinkage, I could still change positions easily. Side – Stark differences between the bed’s arrangements only began to show up when I rolled onto my side. In the firmest configuration, I felt a bit cramped and jammed up in the hips and shoulders as my body came into contact with the dense foam of the base layer. These pressure points are a common problem for side sleepers, who tend to prefer softer, more sinkable comfort layers. 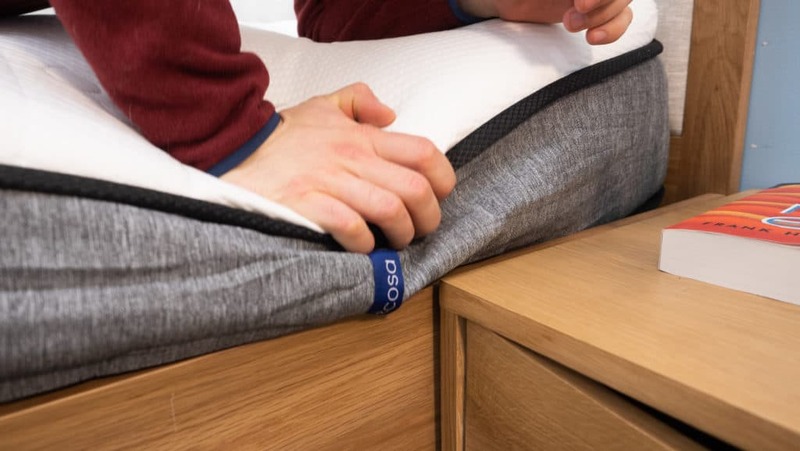 Looking at the medium and medium-firm arrangements, I found the Ecosa to be more forgiving, as the memory foam and poly foam layers provided deeper pressure relief in those configurations. 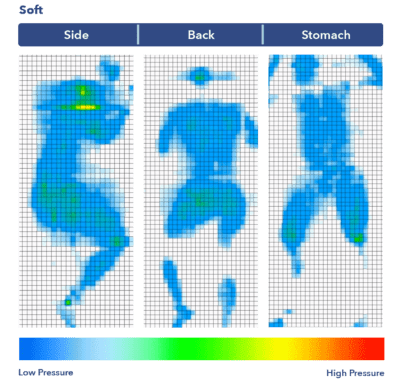 Stomach – Turning over onto my stomach, my weight was once again evenly distributed and the pressure remained low across my body, regardless of configuration. One thing I felt distinctly in this position was the sensation of my hips sinking into the bed. Stomach sleepers often prefer firmer mattresses in order to keep their hips up and spine aligned properly. If you’re a stomach sleeper you’ll likely want to configure this mattress in the firmest arrangement, with the base layer switched out for the top layer so as to provide the best hip and spine support. 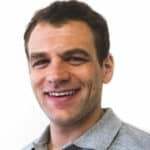 For those of you who share a bed with a partner, you’ll probably want to know what it will feel like when the other person gets out of bed or has a rough night of tossing and turning. 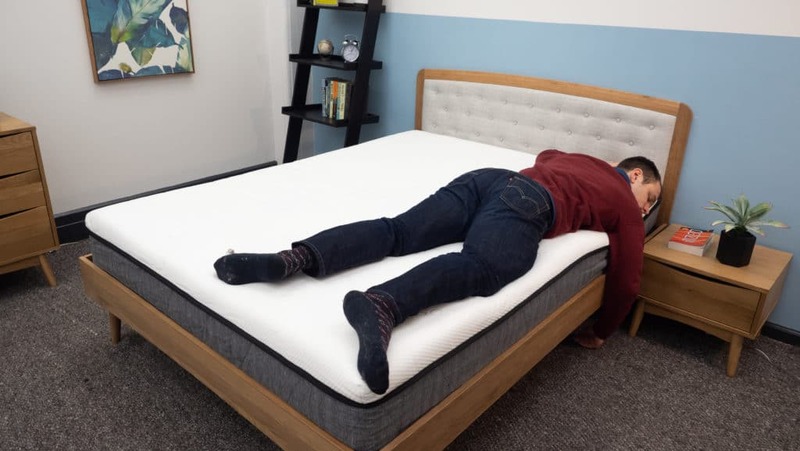 This next test can help simulate that experience, showing the range and intensity of motion that is detectable from one side of the mattress to the other. For this test I dropped a 10 lb steel ball from heights of 4 inches, 8 inches, and 12 inches and measured the disturbance on the other side of the mattress. In the graph below, the larger lines indicate larger disturbances. 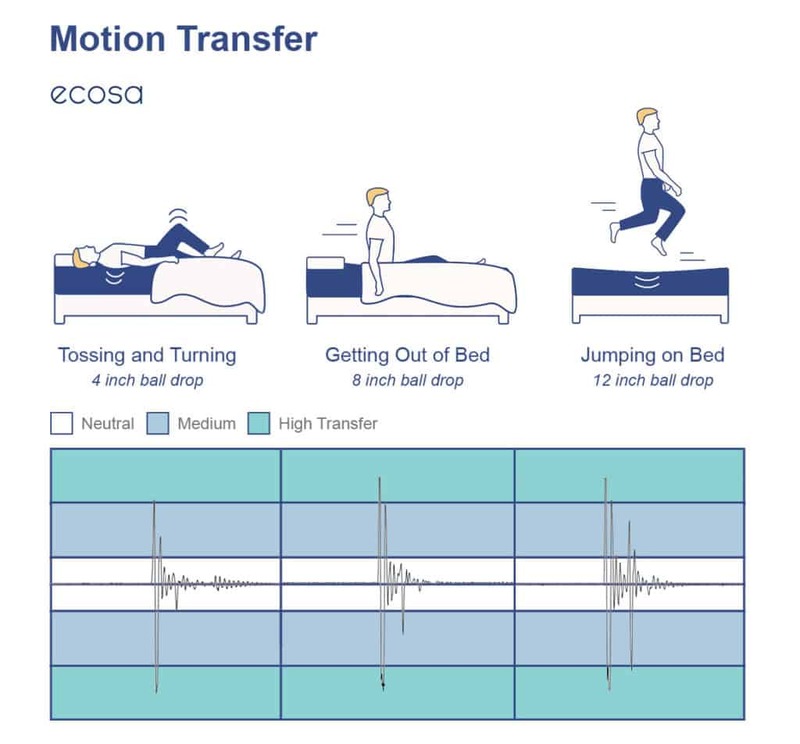 The 4 inch drop represents someone adjusting their position on the other side of the bed and, as you can see in the results above, the Ecosa did a good job of isolating motion from this drop. 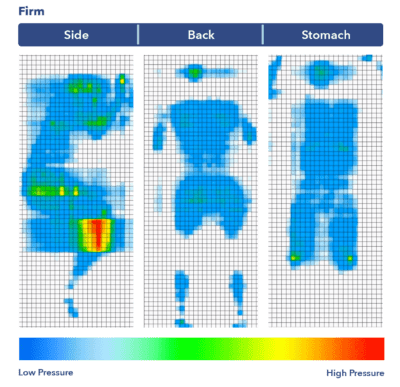 This is a typical positive result for memory foam, which is known for its impressive ability to absorb motion and stop disturbances from traveling across the bed. While the 8 and 12 inch drops do show larger spikes in disturbance, these results are nothing out of the ordinary, demonstrating the degree to which memory foam absorbs the shock of those larger movements. These drops simulate someone jumping into bed, which is going to cause a bit of disturbance no matter how dense the mattress is. In general, I’d say this bed is a fine choice for people who share a bed with a partner. Another important factor to consider when buying a mattress is sinkage, which is pretty much exactly what it sounds like: the amount you sink into the bed when you apply pressure to it. The sinkage of a bed also determines whether you feel like you’re lying “on” the bed or “in” the bed. 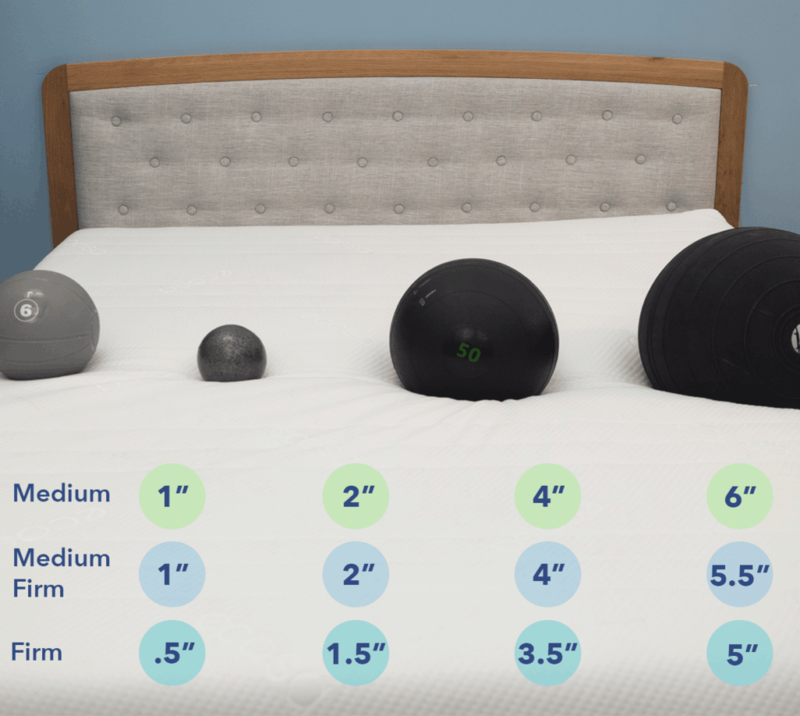 In order to get a good idea of how someone might sink into an Ecosa mattress, I used four balls of varying sizes and densities (a 6 lb medicine ball, a 10 lb steel ball, a 50 lb medicine ball, and a 100 lb medicine ball) and placed them on the mattress to measure how much they compress the surface. These different sizes, weights, and densities help to simulate different parts of the body as you lie on the bed, or folks of different sizes, to give you a general idea of the bed’s overall sinkage. I tested the sinkage in each of the bed’s different firmness configurations, starting with soft, working through medium and ending on firm. 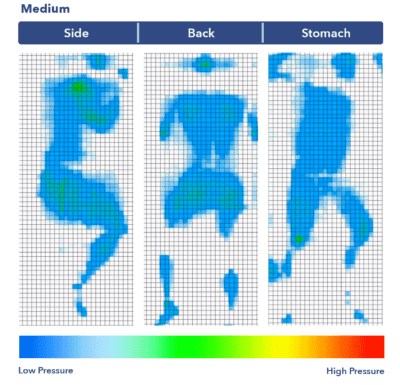 Medium Arrangement – The top layer of memory foam is dense and slow to respond to pressure, so you’ll notice a bit more body-contouring and sinkage. Interestingly enough, the soft and medium arrangements feature almost identical amounts of sinkage. 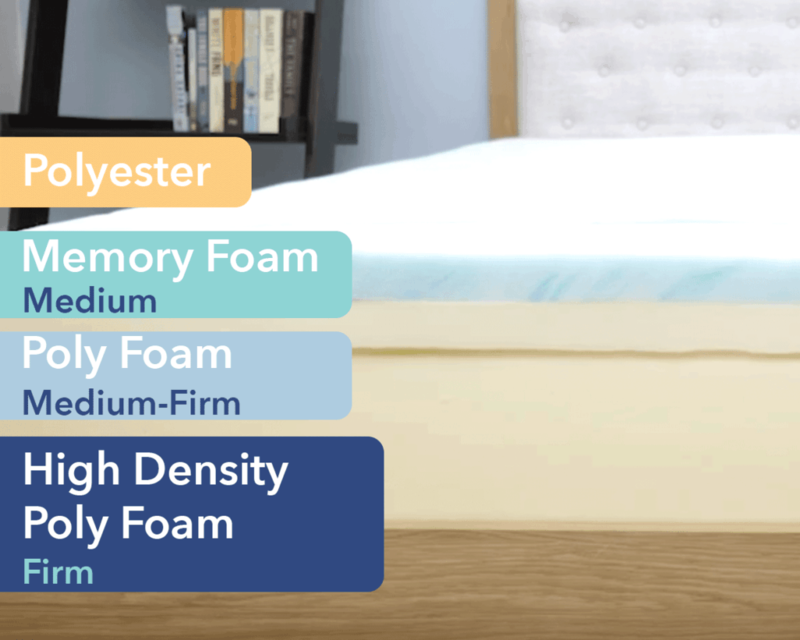 Medium Firm Arrangement – By switching out the top layer of memory foam for the slightly firmer layer of poly foam, the medium firm arrangement produces a slight increase in firmness and a bit less sinkage. Again, the softest and medium layers are nearly identical, with a difference in sinkage only really coming into play with extremely heavy weights and motion disturbances. Firm Arrangement – The sinkage is noticeably restricted in this configuration, and you can really feel the strong structural support of the base layer’s dense poly foam. This setup produces nearly a full inch less sinkage than the soft and medium configurations, which means you’ll likely experience more support and less softness overall. Is the Ecosa mattress right for you? Now that we’ve taken a deep dive into the Ecosa it’s time to discuss a few general recommendations and complaints, which can help you determine if you and the Ecosa are the perfect match. All mattresses have their pros and cons, and as with any mattress, the Ecosa’s unique features will appeal to some sleepers more than others. Great for guests – This bed’s adjustable firmness levels make it an ideal option for guests. Instead of suffering on a bed that doesn’t work for them, or opting to sleep on the couch, guests can change up the arrangement and flip the layers to fit their individual needs. No more worrying about your guest-bed being too soft or too firm for visitors! Good for growing kiddos – If you’ve got kids who are growing fast, this bed might be a wonderful choice. Kids can adjust the firmness levels as their preferences change, which means you might save a pretty penny in the long run. No need to run out and buy a new mattress when your kid suddenly realizes they love to sleep on their back and need a firmer bed. Changing can be a hassle – Changing the firmness levels, while theoretically convenient, is actually a somewhat inconvenient process that takes a bit of elbow grease. It took two people here at Sleepopolis to flip the layers around in a timely fashion. At home, you might want to enlist the help of a friend or family member to help you swap out the layers. This might not be an issue for you, so long as you don’t mind doing a bit of physical labor to get to the firmness level you (or your guests) need. No bounce – Another downside to the Ecosa is that the foam construction and sinkable memory foam layers, while great for absorbing motion, also tend to absorb bounce. The bed doesn’t have springs or coils, materials which provide a classic feeling of bounciness. Sleepers looking for a lot of bounce in a mattress may want to look elsewhere, to a model with less memory foam. Sleep Trial: The Ecosa has a 100-night trial period. Warranty: Ecosa offers a 15-year warranty on this mattress. Shipping: Free shipping, with a 1-7 business day delivery window.